Across Davidson County on Wednesday night, tornado sirens wailed as a powerful storm system marched across the Metro area. But the sirens were sounding some 15 minutes after the National Weather Service had canceled tornado warnings for the area. NASHVILLE, Tenn. (WTVF) — Across Davidson County on Wednesday night, tornado sirens wailed as a powerful storm system marched across the Metro area. But the sirens were sounding some 15 minutes after the National Weather Service had canceled tornado warnings for the area. It was a new issue, in a long line of concerns that some city officials have raised about the antiquated system. In Davidson County there are currently 93 tornado sirens placed strategically throughout the area. However, the sirens are all tied together, meaning officials cannot set them off individually. On Wednesday night, the National Weather Service issued a tornado warning for the western edge of the county near Bellevue, triggering sirens there. The warning expired at 8:30 p.m. but sirens could still be heard in places like Sylvan Park as the time approached 8:45 p.m. But all 93 sirens across the county were also triggered, including some in Goodlettsville that were 20 miles to the northeast -- nowhere near a possible touchdown site. Residents and city council members are once again calling for the outdated system to be upgraded. In 2017 when a similar issue happened, city council members assembled a commission with the Office of Emergency Management, the National Weather Service and the vendor who operates the sirens. A study of the current system showed that it would cost the city $460,000 to upgrade to a polygon-based approach which would allow OEM to operate sirens on an individual basis. But the funds have never been allocated by Metro Council or the Mayor’s Office to authorize the upgrade. “I mean we are talking about pennies here compared to what this would do,” Metro Councilman Dave Rosenberg. Rosenberg says he doesn't understand why smaller counties in middle Tennessee have been able to upgrade their systems to trigger sirens individually, while Davidson County still continues to use and outdated system that does not work well with the way the National Weather Service now issues warnings. He's also concerned that residents won't take the sirens seriously when there is a real threat given how the current system is currently setup to function. On Twitter Wednesday night, the agency defended the system. 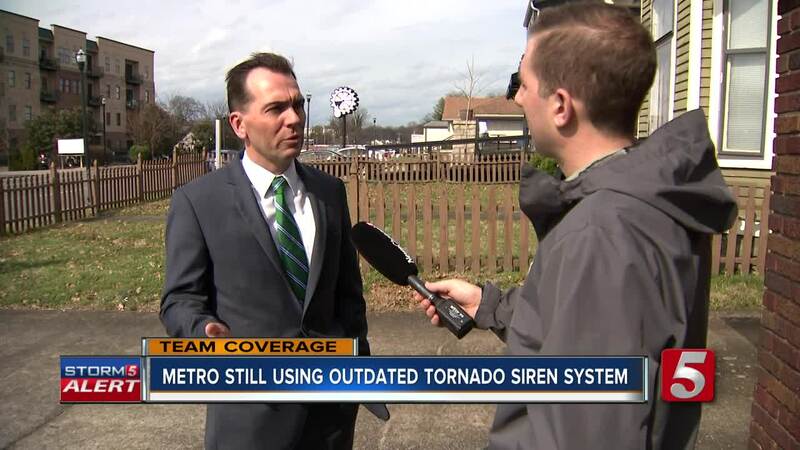 "It is the position of OEM that our system was activated when severe weather and the threat of tornado was effective in the county," one Tweet read. "We say the system is working the way it was supposed to when purchased by metro government and approved by the council," another Tweet said. Still though, many public officials are calling for change. “I am fed up with this archaic siren system and ready to fix it. The system is a threat to public safety, and it’s well past time that we modernized our city’s sirens,” State Representative and Mayoral Candidate John Ray Clemmons said.